As most of you know, Officer Rooks has given us permission and space to build a ranch on a large chunk of one of Gatekeeper's decks to have a suitable home for the Pokemon we had to temporarily leave behind. The schematic itself is rather flexible, mostly an outline of the space necessary, as well as proper enclosures to keep it a 'separate' environment from the rest of the deck. In an effort to both proceed quickly, and to keep all parties satisfied, we should all do our best to cooperate on this project! For an initial thought, I'd like to ask each of you to consider your Pokemon's preferred habitats, and come up with suggestions on how you'd like that represented within our limited space without causing a direct conflict of interest with other Pokemon's preferences. For the second note, we should also compile a list of equipment we think would be useful for the facility to have. JJ would be a good place to ask on that (who is an addition to the mailing list for this message), but that shouldn't exclude anyone's thoughts. For example, we might consider constructing an incubator for long term, or creating a Poffin maker, or a built-in Pokecenter like the one installed on the Blaze. Any other thoughts can also be noted here! Once we have some ideas flowing, we'll start with a basic sim design of the layout we're considering, and once that is settled, we'll work together to begin physical construction ASAP. Thank you for your efforts, everyone. Hope to hear from your soon! Well, Drifblim likes damp spaces. We could either have a tropical rainforest area, or a large lake with a big waterfall. Growlithe loves running around in big grassy areas. I know this because he enjoyed biometrics.... I think having an open field with some trees for shade would be good for him, but not too humid though. As for Koffing... well, Koffing spent most of his time floating around my head, but he seemed to like the environment in biometrics. Maybe something similar to biometrics.... I dunno. I'm stumped. I spoke with Mr. JJ about the subject of preparations and items to requisition, and he was nice enough to volunteer to take the position of ranch hand once the ranch is completed. He said he would be willing to move his store there and continue to operate it, while lending his expertise to looking after the Pokemon there. I would like to thank Mr. JJ once more for his huge generosity and goodwill in offering his services for this. It's going to be a wonderful ranch! I've completed a formal layout and attached the diagram to this posting. I've also made arrangements to import native habitat. That is, a proper layering of forest, and more importantly, native berry bushes for the Pokemon to have their own steady supply from. I'd like to gather everyone assisting in construction together within the next day or two, towards the evening, so please plan on being available if at all possible! Together we can go over the final layout, decide together on any last minute changes, and begin actual construction. Looking forward to seeing you all! ***Attached is the following, except an actual diagram/layout. This image is merely a player's rendition. THE DIAGRAM IS NOT TO SCALE. BUT ITS STILL A GOOD ONE MIND YOU!1! ***And if somehow that is hard to tell from! The majority of the space is reserved for a vast meadow, with a home laid out much like the one on JJ's ranch, with the stables north of it. Attached directly to the home is a section specifically to serve as JJ's new shop, fitted a little larger than his current (presumably will become EVEN more popular with the addition of Pokemon around to draw people there). 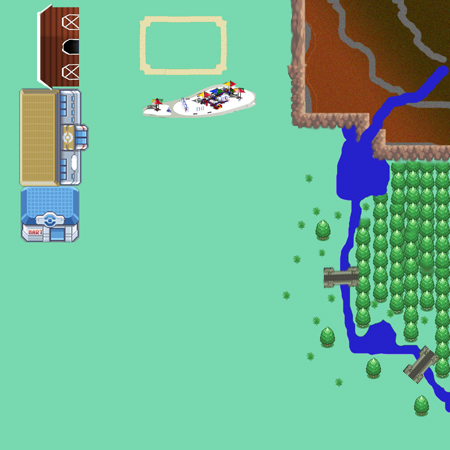 In front of the stables is a leveled track for Poke-competitions, with a leveled playing field situated in the middle, and a Poke-play-ground just south of that (it even has a large globe-like toy for Koffing to orbit around). East of that the terrain becomes exceedingly rocky, and climbs upwards, for all those rowdy and rough rock/ground/steel/etc Pokemon to safely rough-house on. The river comes down this incline on the southern side into a waterfall into a sizable (considering space limitations) pond/lake. Behind the waterfall is a peaceful cave carved out. Several bridges cross the river/stream at a few points. On one side of the stream the foliage is introduced (berry bushes and the like) with a spattering of trees. On the other, the area becomes much thicker, a sizable (again, in perspective of the actual space available, a few acres) forest. Looking good to me! I was wondering about the apparent lack of cave, but it looks like you got that covered! Construction is underway! Foundations have been planted. The following is a list of tasks that are fairly independent of one another. Feel free to start on them as you please! Construction of playground equipment, materials and instructions already waiting. Lay down track, measurements provided. Construction of wooden bridges over carved riverbed, materials and instructions waiting. Plant Berry bushes in proper locations (currently potted, fairly large, but movable via hover cart). Construction of ranch structures (home, store, stables). This will require a little bit of expertise, but those confident should feel free to ask others to assist with proper instruction! Layout and materials waiting. Thank you all again for your efforts! Thanks to the help from everyone, the Ranch has finally been completed! I'll be sending in the request to have our Pokemon transferred at the earliest convenience. In the mean time, our final efforts should be focused on planning any sort of welcoming for them, as well as assisting JJ with moving his shop and anything else to the new location within. If you have any questions, please bring them forward! To elaborate on the description above, the ranch, in very simple terms, is laid out in the following way. -Northwest: Stables, Ranch Home, JJ's shop. -North: Track and playground just south of it. -Northeast: Mountainous area carved out, weather settings set heavy towards the top for occasional snowfall. Carries the addition of an aviary as requested by JJ. -East: Forest area, bordered by the river that waterfalls down off the mountain's edge. Behind the waterfall is a cave area that reveals the way the waterfall is set up actually pushes the water into a swirling pool within before the undercurrent pushes it back and out as a river outside. It is heated within the cave. -Southeast: The river is adjusted to allow the area some more swamp-like properties as requested by Alex for Toxicroak and others. -Southwest: Another body of water borders right along the southwest wall, simulated waves crashing onto a beach setting that extends a bit north, eventually becoming more of a desert spot, as requested by Neo. Everything else not covered is simply meadow/field by default, and takes up the vast majority of the space.